The opening live action sequence, featuring Jackie Chan, feels abrupt and forced, and sadly his jokes fall flat. Perhaps the movie knew that the Karate Kid-esque opening, and closing, weren’t its strong points so it moved on quickly. Little time is spent in the “real world” and for good reason. The film keeps a steady pace of action and humor throughout, without a ton of needless worrying about things like backstory. 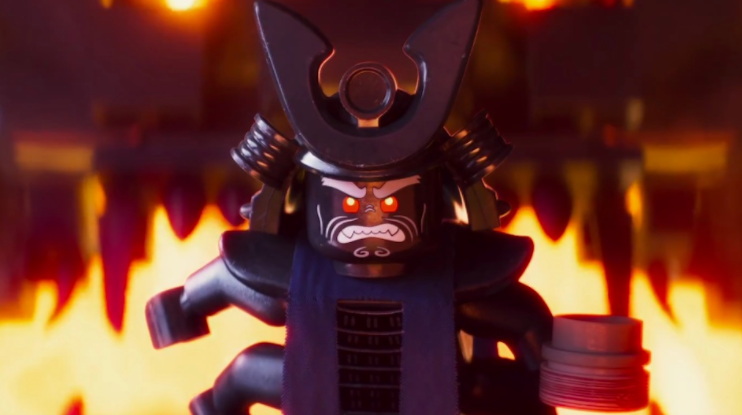 We jump right into the life of Lloyd, his ninja friends, and their ongoing quest to save Ninjago City from the evil Lord Garmadon, who happens to be Lloyd’s father. You learn just enough about each of the Ninja to be able to tell them apart- Cole (the earth ninja) likes music, Jay (the lightning ninja) is scared of everything, Zane (the ice ninja) is a robot, Nya (the water ninja) is outgoing and (over)confident, and Kai (the fire ninja) is… there? Sadly he has no defining trait. Lloyd (the green ninja) is the main focus of the story and reminds me a bit of Luke Skywalker – has long, blonde hair, daddy issues, and whines a lot. Fortunately for us and the story he does grow into a leader and leaves his whining behind. Despite the character flaws, there is a lot of fun to be had watching Ninjago. It contains the same lighthearted wackiness and over the top comedy as the Lego Movie, and expertly sneaks it into the film at unexpected times. I will not be dreading seeing this again with the kids and am actually looking forward to it. For those of you that followed the cartoon show, Ninjago: Masters of Spinjitzu, and are wondering how this fits into that storyline… it doesn’t. At all. All of the characters names are the same, and some of them look the same, but the characters themselves are very different. There are some Easter Eggs thrown in just for us, like Lloyds cell phone ringer being the tv show theme song, but otherwise it has little to do with the 7 seasons that came before. I’m not sure how many more Lego franchise films we’re going to see, but it’s not hard to imagine a Nexo Knights, Elves, or Chima movie in the future. For now, I’m still willing to join the adventure. This entry was posted on Wednesday, September 20th, 2017 at 8:04 pm	and is filed under Film, News. You can follow any responses to this entry through the RSS 2.0 feed. You can skip to the end and leave a response. Pinging is currently not allowed. « Film Review: ‘Kingsman: The Golden Circle’!